As published in the Weekend Argus: Locals were invited to participate in a water crisis hackathon on 14 & 15 April 2018, and were challenged to “build resilience”, as the city’s Day Zero team battles to win its war against the ongoing drought. Sarah Rushmore, a City of Cape Town official who works on the Day Zero campaign, told all participants at the briefing, “the government needs help, the city can’t do this alone.” She also emphasised that Day Zero was “still with us”, and although it has been pushed back to 2019, it has been creating the impression that water savings were no longer a priority, yet the possibility of running out of water is real. 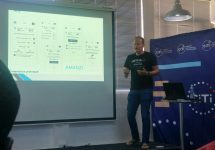 The hackathon, called Water Saving Design Sprint, took place at The Bandwidth Barn in Woodstock. The City of Cape Town and local start-up support organisation Cape Innovation and Technology Initiative (CiTi) were running the event. Anyone could sign up, and Yellowtail Software promptly sent in a team of highly skilled staff to assist in ideating and prototyping for this crucial initiative. The challenge was to “design a digital campaign, tool or app that will motivate people to make water saving their new normal”, following the Design Thinking methodology. A total of 10 teams across different organisations and companies participated, and it turned into a major brainstorming mega event that literally lasted from 08:30 on Saturday, until 18:00 on Sunday. Some teams even slept over at the venue, to complete their prototypes. Each team had to pitch their water crisis solution to experts for evaluation – they were looking for something thoughtful. Team Yellowtail focused on empathising with the user, by creating a typical persona, who is an individual who really wants to assist in water saving, but does not quite know how to further save beyond the 50L per day allocation. How could we engage the whole of South Africa to participate in the Western Cape water crisis? We brainstormed a multifaceted solution that would place water saving on top of mind, reward citizens for good water saving behaviour, and also contribute towards the generating of funds for desalination (and other) projects. We had a total of 9 staff participating, and we created a prototype of a mobile app, that would be beneficial to the ongoing water saving crisis. Team Yellowtail received a positive response from the judges, our solution having been “an interesting concept”. We are hoping for further engagement with the City of Cape Town on the Day Zero crisis.